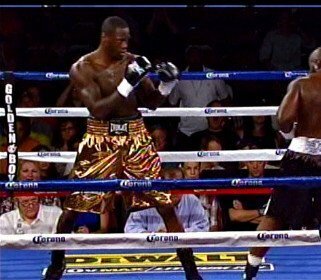 By Michael Collins: It’s unclear whether his promoters at Golden Boy Promotions wants to move him up yet against better opposition, but 6’7″ heavyweight prospect Deontay Wilder (24-0, 24 KO’s) says he’s ready to start facing the best fighters in the heavyweight division finally after obliterating 35-year-old Kertson Manswell (22-6, 17 KO’s) in a 1st round TKO last Saturday night at the Exposition Hall in Mobile, Alabama. Wilder’s power was too much for Manswell, as he was knocked down three times before the referee gave Manswell the hook to spare him another knockdown. Wilder wasn’t ready a year ago, because he was still pretty much a fighter completely dependent on his right hand do everything for him. But in the last year, Wilder has vastly improved his left hook and jab and now he’s an all around threat to anyone in the division. It’s still hard to tell where Wilder is defensively, because he’s not faced anyone that can take his power long enough to land their own shots. Judging by the jabs that Wilder was getting nailed with in his recent fight against Owen Beck last June, I think Wilder still needs a lot of work defensively. He needs to learn how to slip a jab and block a right hand. Beck was able to land some clean shots when he wasn’t getting knocked down over and over again. Wilder definitely needs to step it up against better opposition, but the question is who should he face? He probably needs a decent journeyman level fighter for his next bout, someone like Michael Grant or Matt Skelton. Those guys would be perfect for Wilder, because he maybe get a few rounds in before knocking them out. Skelton has a pretty good chin and he might be able to make it past the 3rd round if Wilder doesn’t connect cleanly. I’m not so sure about Grant. I think he could go in the 1st round if Wilder hits him hard. However, these are just a couple of the type of opponents that Wilder needs to start facing in the near future. He can’t be fighting Owen Becks and Kertson Manswell type opponents any longer if he wants to keep improving because he’s not getting anything out of these types of fights. Previous boxing news: Naseem Hamed – Where Does “The Prince” Belong Amongst the Best Featherweights In History?